Every youth pastor I know plans retreats. They give their time and effort and some of their best creative energy into retreat planning because they know that retreats can and do change lives. Despite the fact that they always cost additional time, money, and often require huge planning steps of faith- they still do them because they are inherently risky and fun and unparalleled memory making ventures. But here’s the rub though…. not many of those same youth pastors plan great trips for their family. For years I too put more effort into planning summer camp than a summer vacation. I justified this as part of my job and brought my wife and kids with me anytime I could. I still do that cuz I want both my own kids and my students exposed to the intersection of ministry and family. But recently, especially as my kids have gotten older they started complaining that the stories they heard me tell about our youth group retreats were things they wanted to do too. Telling them “just wait till you’re in high school” was not going to cut it either. So over the last few years now, I’ve become increasingly convicted that if I’m not willing to do this for my own family, I should not be doing it for ministry. I mean really: Why in the world would I give my most creative energy to the students I work with for a season at the expense of the family I’ll be connected to for rest of my life? Family and Ministry Trips both cost money I don’t easily earn. 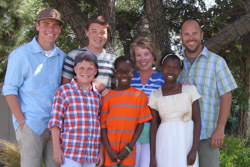 Family and Ministry Trips both cost a lot of time. Family and Ministry trips both require planning, preparation, and hours of clean up too. Family and Ministry trips both have me asking, “Why did I do this to myself, I should have just played it safe and done none of this” in the preparation stage. They are also both quickly followed with, “I wouldn’t trade this for the world moments”when they’re done too. So from one parent/pastor to another, go ahead and plan that family trip with as much gusto as you do your next ministry trip. You and your family will be so glad you did. Hearing my kid brag about our family trips makes it all worth it.